On 21 April, ISIS Fezzan Branch published a series of photos and a short video of an alleged attack on LNA forces south of Sebha. This follows the publication of ISIS Naba no. 178 on 18 April, which included details of ISIS’ assault on Ghadduwa. On 21 April, unconfirmed reports suggested some Misratan forces had withdrawn their troops from Tripoli following a breakdown in relations with Tajoura’s 33 Infantry Brigade. The point of contention was the alleged presence of Benghazi Revolutionary Shura Council members within their forces. On 15 April, US President Donald Trump had a phone conversation with Libyan National Army (LNA) Khalifa Haftar. On 22 April, GNA Prime Minister Fayez al-Serraj played down the conversation between Haftar and Trump, saying that while he hadn’t spoken to Trump his engagement with the US administration suggested they opposed his military actions. On 22 April, the Libyan National Army (LNA) spokesman, Ahmed al-Mismari, claimed the LNA would intensify its assault on Tripoli. 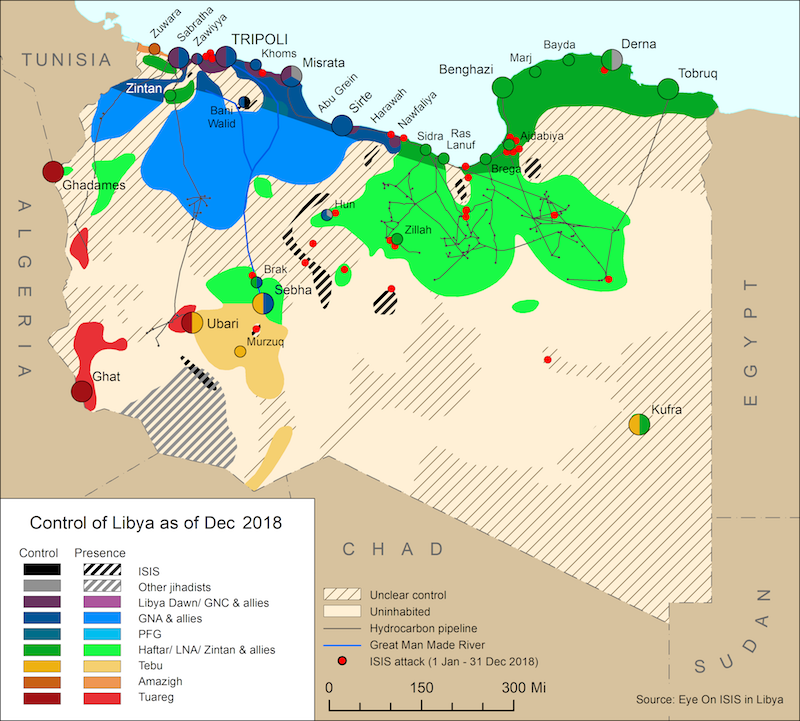 On 22 April, Government of National Accord (GNA) Prime Minister Fayez al-Serraj stated he wouldn’t negotiate with Khalifa Haftar until his forces have withdrawn from the capital. On 13 April, the GNA Ministry of Interior announce the arrest of ISIS member Anas Abrik Zouki. 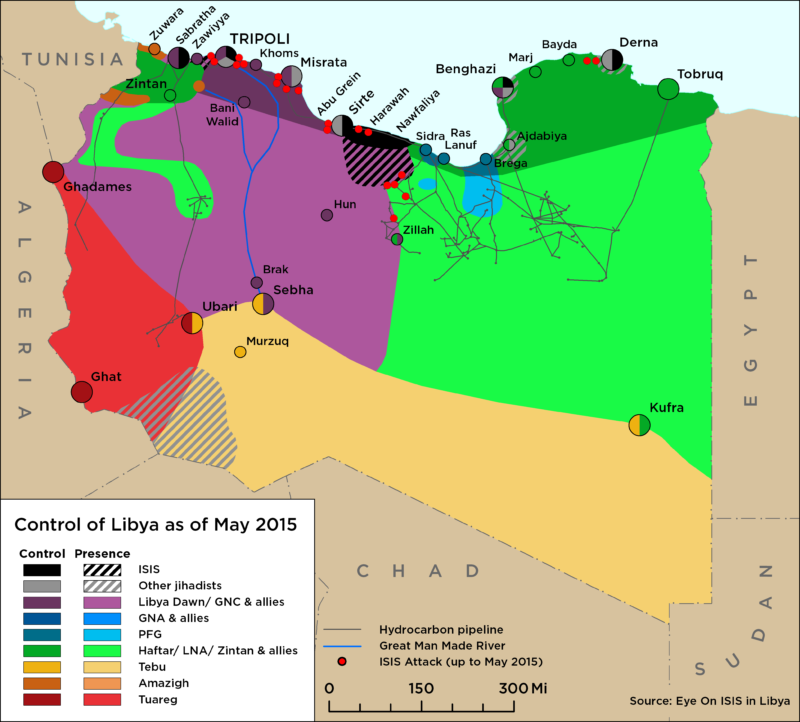 On 11 April, ISIS claim to have killed six LNA fighters in Ghadduwa, in south-western Libya. On 11 April, ISIS released its Naba newsletter no. 177 , which included details on the group’s recent attacks on Fuqaha and Ghadduwa. On 11 April, senior leader of the Benghazi Defense Brigade Ziyad Belam was seen participating clashes in Tripoli.